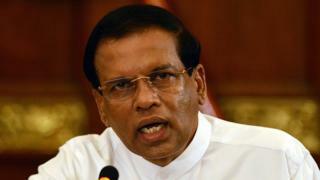 Sri Lanka’s national airline has found itself in trouble with the country’s president – over a few nuts. President Maithripala Sirisena has complained that, during a recent trip with Sri Lankan Airlines, he was treated to some cashews which were not fit for human consumption. In fact, the irate leader added, they were not even suitable for dogs. The airline, which has at least $1bn (£770m) of debt, has yet to comment on Mr Sirisena’s outburst. The airline has been dogged by allegations of corruption in recent years, and is currently under investigation by a special presidential commission of inquiry. However, exactly what was so offensive about the nuts is unclear. Speaking at a farmers’ event in southern Sri Lanka on Monday, Mr Sirisena said the offending products were served to him during a flight from the Nepalese capital Kathmandu to Colombo, Sri Lanka, last week. “When I returned from Nepal, they served some cashew nuts on the plane [that], let alone humans, even dogs can’t eat, who approves these things?” he told a group of farmers in Southern Sri Lanka. This is not the first time a packet of nuts on a plane has made headlines. Four years ago, a Korean Air executive made a plane turn back to the gate after an air stewardess attempted to serve her a packet of macadamia nuts in a packet rather than on a plate. Heather Cho, the daughter of company boss Cho Yang-ho, was later convicted of violating plane safety, spending a number of months in jail before being freed to serve a suspended sentence on appeal.